I’d never thought of it before I read an article by Stellacat at Aquilus, but she’s absolutely right. 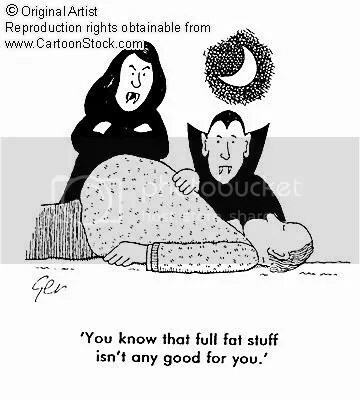 Feeding is vital in the life of any psychic vampyre, it’s true. But–so is eating. I know it sounds like a no brainer, but with our generation’s growing adoration for fast food–we aren’t really “nourishing” our bodies anymore, let alone our energy and chakras. Again, I hadn’t thought about it before, but everything we consume holds energy, and has an “energy imprint.” Basically, it holds energy in the form of nutrients, it holds the energy of the animal it came from (if it’s meat), the energy of the people who handled it before it got to you. So–think about it. Where did your food come from before it got to you? Pardon me for being extreme, but the reality is, a lot of animals that are slaughtered for food are treated terribley inhumanely and all of the emotions, fear, pain, etc. that they felt before they were killed remains in the meat. (Wow, morbid, sorry, but you get the idea.) Think about all the hands of all the people that handled that apple, or all the processing those canned vegetables went through. Basically–if your energy circulation if hindered by a terrible diet, it closes down your chakras which also prevents you from being able to take in and process energy to its fullest extent while you’re feeding–this leads to you being hungry more often, feeding more often, and just not feeling your best. Not to mention, eating these foods, drinking these drinks, and using these spices will not only help open up and ground your chakras, but will help with other things while you’re at it. For example, feeding your solar plexus will help raise your self-esteem, feeding your heart chakra helps heal emotional upsets, your throat chakra allows you to speak your truth, and your crown chakra helps open and clear spiritual communication. And don’t forget to always be conscious of where the food is coming from. Food from the local or farmer’s market is of course handled by less people, processed far less, and generally more organic and better for you.